Our team will pick you up from airport or train station and transfer to hotel in UB city. 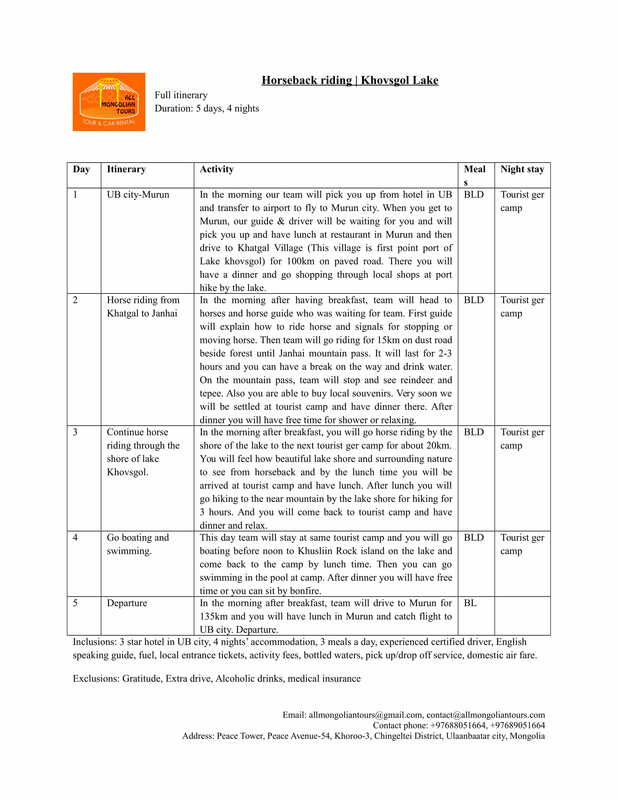 You will relax at hotel and you can go shopping or prapare for tomorrow's journey. Day 1. 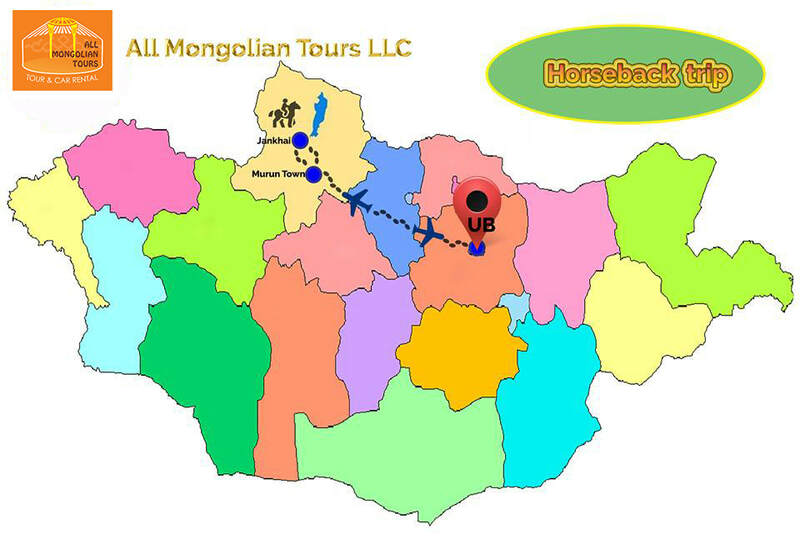 In the morning our team will pick you up from hotel in UB and transfer to airport to fly to Murun city. When you get to Murun, our guide & driver will be waiting for you and will pick you up and have lunch at restaurant in Murun and then drive to Khatgal Village (This village is first point port of Lake khovsgol) for 100km on paved road. There you will have a dinner and go shopping trough local shops at port hike by the lake. Day 2. In the morning after you breakfast, team will head to horses and horse guide who was waiting for team. First guide will explain how to ride horse and signals for stopping or moving horse. Then team will go riding for 15km on dust road beside forest until Janhai mountain pass. It will last for 2-3 hours and you can have a break on the way and drink water. On the mountain pass, team will stop and see reindeer and tepee. Also you are able to buy local souvenirs. Very soon we will be settled at tourist camp and have dinner there. After dinner you will have free time for shower or relaxing. Day 3. Continue horse riding through the shore of lake Khovsgol. In the morning after breakfast, you will go horseriding by the shore of the lake to the next tourist ger camp for about 20km. 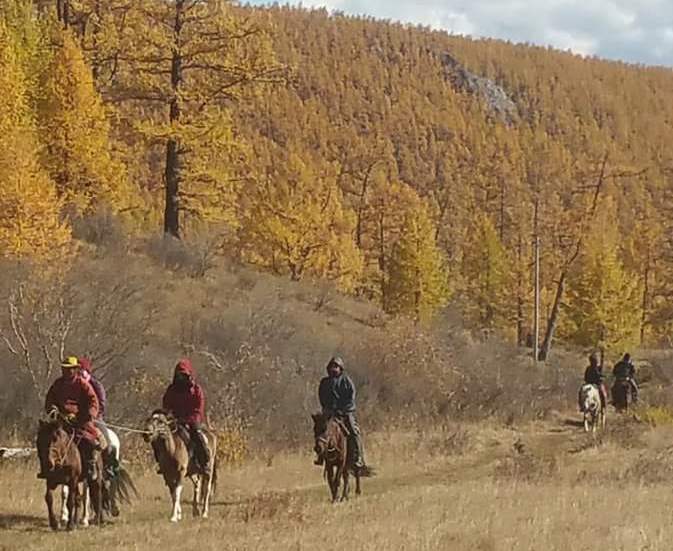 You will feel how beautiful lake shore and surrounding nature to see from horseback and by the lunch time you will be arrived at tourist camp and have lunch. After lunch you will go hiking to the near mountain by the lake shore for hiking for 3 hours. And you will come back to tourist camp and have dinner and relax. Day 4. Go boating and swimming. This day team will stay at same tourist camp and you will go boating before noon to Khusliin Rock island on the lake and come back to the camp by lunch time. Then you can go swimming in the pool at camp. After dinner you will have free time or you can sit by bonfire. Day 5. In the morning after breakfast, team will drive to Murun for 135km and you will have lunch in Murun and catch flight to UB city. Departure.